The best way to start this review of tipster Alec Pearce from BetAdvisor is probably to explain what the operation is all about. BetAdvisor isn't a tipster or advisory service itself, as such, but more of a repository of individual tipsters, operating under one banner. They boast over 75 different tipsters (we're not reviewing all of them!) across 9 sports (we're not doing all those either!) and claim to have made massive profits for their members. Subscription fees vary from tipster to tipster, but I should point out that they're not cheap! But initial cost of a service shouldn't put you off, if the profits are sustainable and enough to more than cover your subscription fees. We're going to focus on their top four horse racing tipsters and this review relates to Alec Pearce, currently ranked no.1 of all the racing tipsters on BetAdvisor, charging £79 per month for his selections. To date, Alec Pearce has made 220 selections for a total stake outlay of 12830 units. Alec Pearce uses a variable staking pattern and to date, his average bet size is 58.3 units, so for the purpose of our review we will declare 1 unit to be worth just £0.17, making for an average stake of £9.91 to bring the review in line with our normal nominal £10 level stake policy. David Sutton will monitor the performance of Alec Pearce for the next 60 days, declaring our results at the odds advised in the emails we receive from BetAdvisor each day. The best way to start this review of tipster James Tucker from BetAdvisor is probably to explain what the operation is all about. We're going to focus on their top four horse racing tipsters and this review relates to James Tucker, currently ranked no.2 of all the racing tipsters on BetAdvisor, charging £79 per month for his selections. To date, James Tucker has made 883 selections for a total stake outlay of 49,790 units. James Tucker uses a variable staking pattern and to date, his average bet size is 56.4 units, so for the purpose of our review we will declare 1 unit to be worth just £0.18, making for an average stake of £10.15 to bring the review in line with our normal nominal £10 level stake policy. David Sutton will monitor the performance of James Tucker for the next 60 days, declaring our results at the odds advised in the emails we receive from BetAdvisor each day. The best way to start this review of tipster Aiden Monroe from BetAdvisor is probably to explain what the operation is all about. BetAdvisor subscription fees vary from tipster to tipster, but I should point out that they're not cheap! But initial cost of a service shouldn't put you off, if the profits are sustainable and enough to more than cover your subscription fees. 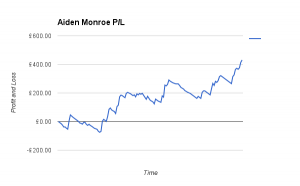 To date, Aiden Monroe has made 1973 selections for a total stake outlay of 145,790 units. 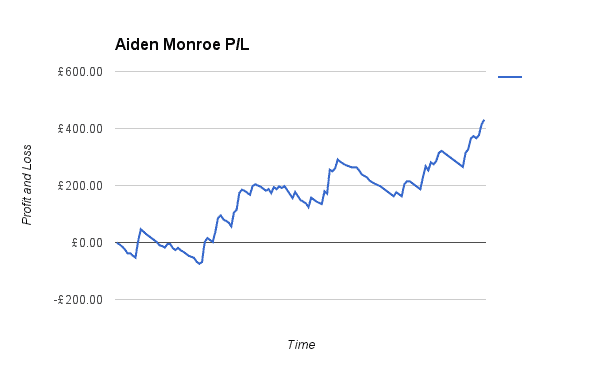 Aiden Monroe uses a variable staking pattern and to date, his average bet size is 73.9 units, so for the purpose of our review we will declare 1 unit to be worth just £0.14, making for an average stake of £10.35 to bring the review in line with our normal nominal £10 level stake policy. David Sutton will monitor the performance of Aiden Monroe for the next 60 days, declaring our results at the odds advised in the emails we receive from BetAdvisor each day. of course, keep you informed of future developments. This has been a sterling performance over the (interrupted) 60-day trial by Aiden Monroe and the figures indicate profit, value and skill. Even with fees included (2 months at £119.00), the trial has turned a very handsome profit of £192.89 or, 1377 points at £0.14/point used for the review. The BetAdvisor support systems are one of the slickest, most professional you will encounter. The emails are very professionally presented and the Aiden Monroe selections are consistently delivered by email in the mid-morning period between 8 and 10. There are variations but these are usually because the selections are emailed the evening before. Generally, there's an email announcing the imminent arrival of selections (say within the next 10 minutes), an email for each selection and once the result is known, another email is delivered with the good news. In support of the email system, each member is granted a login to their website and the selections are available to you there. In addition, you can manage your subscription(s) and monitor performance of the tipster(s) in your BetAdvisor portfolio. One thing you might find useful is the ability to pause a subscription. There are terms and conditions on how many pauses you may take but this would appear to be useful when you want to forget about tipsters while taking that Caribbean cruise you've dreamed about! The best way to start this review of tipster John Sills from BetAdvisor is probably to explain what the operation is all about. We're going to focus on their top four horse racing tipsters and this review relates to John Sills, currently ranked no.4 of all the racing tipsters on BetAdvisor, charging £159 per month for his selections. To date, John Sills has made 659 selections for a total stake outlay of 50,600 units. John Sills uses a variable staking pattern and to date, his average bet size is 76.8 units, so for the purpose of our review we will declare 1 unit to be worth just £0.13, making for an average stake of £9.99 to bring the review in line with our normal nominal £10 level stake policy. David Sutton will monitor the performance of John Sills for the next 60 days, declaring our results at the odds advised in the emails we receive from BetAdvisor each day. This is to let you know that John Sills will stop sending out tips from 30th January 2015 to 6th February 2015. This trial has been automatically extended for 8 days, corresponding to the duration of John Sills's absence. This is a similar move to Aiden Monroe.